B1 and B2 are offside chasing A1, who has possession of the ball. A2 commits a personal foul. RULING: Slow whistle until A2 commits foul. B1 and B2 serve 30 seconds each, and A2 serves one minute (or more). Penalty time is to be served in accordance with 7-2-1d (all serve the first 30 seconds time). Team A gets possession of the ball unless Team A has more penalty time, in which case Team B would get possession. Always a good read before the season begins! Without a doubt, the most confusing section of the lacrosse rulebook is Rule 7-6: Simultaneous Fouls. Many veteran officials make these calls incorrectly without realizing it, because in few cases do the coaches—or anyone else watching the game—understand the correct enforcement. Of course, that doesn’t mean that you shouldn’t be trying to make the right calls! One source of confusion regarding simultaneous fouls comes from NFHS Rule 7-2-1-d, which often comes into play when enforcing simultaneous fouls but also affects fouls that are not simultaneous. This rule states that from the time of the first timeserving foul until the whistle blows to restart play, all of the common penalty time between players of opposing teams is non-releasable. A better way of thinking about this is that Rule 7-2-1-d applies when penalties from opposing teams start on the same tick of the clock: opponents who start penalties together serve together. For example: A1 has possession and is held illegally by B1, flag down. Then A1 is slashed by B2, flag down. A1 passes the ball out of the attack area, ending the flag down, and then A1 retaliates by cross checking B2, earning a 2-minute unsportsmanlike conduct penalty. In this case, B1 will serve 30 seconds, B2 will serve 1 minute, and A1 will serve 2 minutes. All of these penalties will start running at exactly the same time. Since the longest common penalty time between players of opposing teams is 1 minute, all penalties of 1 minute or shorter are non-releasable, so the penalties on B1 and B2 are non-releasable. A1’s penalty would have been non-releasable for the first minute and releasable for the second minute, except that his penalty was an unsportsmanlike conduct penalty, so the entire two minutes is non-releasable. Because Team A had a dead-ball foul, possession is awarded to Team B. 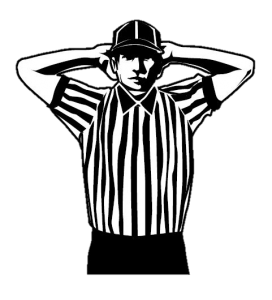 Remember that 7-2-1-d does not apply if the penalties start at different times (e.g., if B1 has 25 seconds left in his technical foul penalty and then A1 gets a 1-minute personal foul penalty, both penalties are releasable since they didn’t start on the same tick of the clock). Why do we have Rule 7-2-1-d? Most people don’t understand why we have Rule 7-2-1-d in the first place. Consider a situation in which A1 and B1 slash each other and get sent off for 1 minute each, so the teams will restart play 5-on-5. If we didn’t have Rule 7-2-1-d, both penalties would be releasable. Suppose Team A scores in 15 seconds: that’s an even strength goal. In the absence of 7-2-1-d, B1 is released by the goal, so Team B now enjoys a man advantage for 45 seconds. During that man-advantage, Team B scores. What’s the net result? Team A scored an even-strength goal, while Team B scored a man-up goal. Team B obviously gets the better side of the deal despite the fact that the original penalties were exactly equal. Since this seems unfair, we have Rule 7-2-1-d to prevent this from happening: the teams play 5-on-5 for one minute no matter how many goals are scored. Simultaneous fouls are fouls called on players of opposing teams during a live ball or a dead ball when sequence cannot be determined. Simultaneous fouls are fouls called on players of opposing teams during (1) a live ball; or (2) a dead ball when sequence cannot be determined. Thus, we need to meet a few conditions for it to be a simultaneous foul situation. First, we have to have fouls on players from opposing teams; if all the fouls are on one team, we don’t have simultaneous fouls. Second, we either need those fouls on opposing teams to occur during a dead ball in a way that keeps us from determining the sequence or we need them to occur during the same live ball. This is yet another source of confusion: the everyday meaning of “simultaneous” is “at the same time,” but the lacrosse rules define “simultaneous” differently from the common usage. “Coincidental” might have been a better word. As an official, the key factor in determining whether you have simultaneous fouls is that—once you have a live-ball foul on Team B—you must determine whether a subsequent foul on Team A is live-ball or dead-ball. When we have simultaneous fouls with penalty time to be served by each team, we will always have to remember to apply 7-2-1-d, as we have to any time penalties from opposing teams start on the same tick of the clock. The ball is awarded to the team with less overall penalty time (look at the total time for all penalties in the simultaneous foul situation for each team). If the teams have the same overall penalty time—or no penalty time at all—award to the team in possession or entitled to possession if there is one. If the teams have the same overall penalty time—or no penalty time at all—and no one is entitled to possession, award by alternate possession. An exception is that if a face-off is pending in this situation, you have the faceoff. Team A has possession and calls timeout. Both teams delay the game. These are simultaneous technical fouls with Team A in possession and no penalty time for either team, so Team A maintains possession. B1 slashes A1, flag down. A1 then wards, resulting in a whistle. Since the flag-down denotes possession, Team A is entitled to possession. The technical foul (ward) by A1 serves merely to end the flag down and carries no penalty time, while B1 serves a 1- to 3- minute personal foul. Since Team A has less overall penalty time, Team A is awarded possession. B1 slashes A1, flag down. A1 then slashes B1, resulting in a whistle. Assuming both slashes are of the 1-minute variety, the total penalty times are equal. Since the flag-down denotes possession, Team A is entitled to possession, so Team A is awarded possession. By rule 7-2-1-d, these penalties are non-releasable. Prior to a face-off, the sticks of A1 and B1 are found to have deep pockets (neither was the goal scorer). Both players serve 1-minute non-releasable penalties. Since penalty time is equal and no one is in possession or entitled to possession, a face-off is held. Of course, a subsequent dead-ball foul could always change the team being awarded possession. Before a face-off, Team B delays the game, then A1 commits a conduct foul, then A2 commits a conduct foul. These are not simultaneous fouls, because we can follow the sequence. Team B’s technical foul (delay) awards possession to Team A (since no one is in possession when a face-off is pending, we can think of it as if the ball is loose). A1’s technical foul (conduct) awards possession back to Team B. Now A2’s conduct foul occurs with Team B due possession, so A2 serves 30 seconds. We simply follow the sequence of fouls and assess them one at a time. There are two main instances where you have dead-ball simultaneous fouls. The first is illegal equipment during a dead-ball inspection. If you inspect A1 and B1 after a goal and they both have 3-minute illegal stick penalties, it doesn’t make sense to award possession based on the order you inspected the sticks: they were both illegal at the same time, and the order you discovered those violations is irrelevant. The other time you get dead-ball simultaneous fouls is when the officials simply can’t determine the order of the fouls. If the officials hear a scuffle, turn around, and find two players fighting with no indication of who started, they will be forced to treat the fouls as simultaneous. Similarly, if two officials spot dead-ball fouls in different areas of the field but neither one knows which occurred first, they will again have to treat the fouls as simultaneous (even though, in reality, one of them likely preceded the other). Live-ball simultaneous fouls are much more common, and they come in a variety of packages. The important thing to remember is that to have live-ball simultaneous fouls, you must have fouls on both teams during the same live ball. There are two main cases: either the ball is loose or the ball is in possession when the first foul occurs. If the ball is loose when B1 commits a technical foul, then Team A commits a technical foul, we have live-ball fouls on opposing teams and thus have simultaneous fouls. But this one is easy: since there is a play-on for the foul by Team B, the foul by Team A serves only to end the playon. Team A will be awarded possession, and that’s the end of the story. This is because the team entitled to possession committed only a technical foul (NFHS 7-6-3-b-1). However, if the ball is loose when B1 commits a technical foul, then Team A commits a personal foul, we have a much different situation. We still have simultaneous fouls, but here the team in possession committed a personal foul. By rule, that means all players involved serve penalty time, including B1, who committed a loose-ball foul (NFHS 7-6-3-b-2). To many people, it seems wrong to make B1 serve for, say, a loose-ball push, but if you don’t then B1 goes completely unpunished for the push (his team would be man-up for a minute and have possession). In fact, who knows if A1 would have even slashed B1 if B1 hadn’t pushed him? Doing it this way makes sure both teams are punished for their fouls, with Team A being punished more severely for the more severe foul. A.R. 17. During a loose ball, B1 pushes A1 from behind and a play-on is called. While the ball is still live, A1 turns and slashes B1. RULING: These are simultaneous fouls. Since Team A was entitled to possession, all players involved serve penalty time. B1 serves 30 seconds and A1 serves one minute, with the first 30 seconds of each penalty being nonreleasable. In this case, Team B is awarded possession because Team B has less overall penalty time. Although the NFHS rulebook doesn’t contain this particular situation, the NFHS Rule 7-6 is the same as NCAA Rule 7-6 on this point, and this NCAA ruling is merely an illustration. Note that this rule can turn some fouls that you might never think of as being timeserving just that. This is one of the many reasons to keep your play-ons short! If Team A has possession and there is a foul by Team B—with Team A maintaining possession—we have a flag down. If Team A commits a foul while the flag is down, we will have fouls on both teams during the same live ball and will again have simultaneous fouls. If the foul by Team A is a technical, it merely ends the flag down. A Team B player will serve penalty time and Team A will be awarded possession. But if the foul by Team A is personal, then the foul again stops play, but now Team A and Team B will both serve penalty time. If the penalty time is equal, Team A maintains possession since the flag down denotes possession. Otherwise, the team with the lesser total penalty time is awarded possession. As usual, 7-2-1-d comes into play and the common penalty time will be non-releasable. Finally, since we have simultaneous fouls, there’s no free clear: the ball is put into play where it was or, if necessary, moved outside the attack area. The exception to Rule 7-3 tells us that if we have live-ball simultaneous fouls with penalty time to be served by each team, we start play at the spot where the ball was or outside the attack area. In other words, we do not award a free clear in those situations. The rules do not specifically address where to restart in dead-ball simultaneous foul situations. It doesn’t seem to make sense to award a free clear in those situations either (if Team A scores a goal and both teams have 3-minute non-releasable stick penalties, Team A loses the goal and possession if Team B happens to have the possession arrow; why should Team B get a free clear just because they have the possession arrow?). The simultaneous foul rule is without a doubt the most complicated rule in the rulebooks. But if you understand the principles behind it, you can make the right call every time. Thanks to Matt Dempsey, Peter Boyd, Michael Williamson, Wayne Embry, and Jim Shaw for comments on a draft of this article.